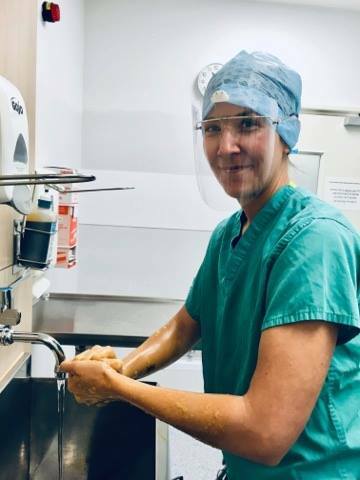 “Following completion of my training with Staffordshire University I initially worked at Birmingham Children’s hospital for a couple of years before returning to Shrewsbury last July. “The role of an Operating Department Practitioner (ODP) is very varied, so there are no typical days as such. The three main aspects of the ODP role are anaesthetics, scrub and recovery. Here at RSH I work both within anaesthetics and on scrub. “On anaesthetics your day will start by checking the anaesthetic machines, vital sign monitoring, airway equipment and ensuring everything is safe and you are set up and ready to accept your first patient. 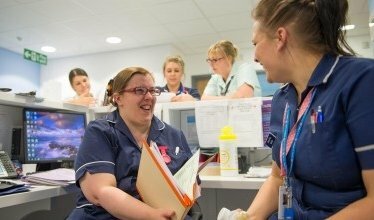 You work closely with the anaesthetist and discuss each patient in detail with your team to ensure everything is ready for when they arrive in the anaesthetic room. “The good thing about being an ODP is that no two days are ever the same. I have been placed within the emergency theatre since returning to the Trust, so I never know what the next day will bring. It’s a very varied job where you learn new things every day and I really enjoy this aspect of it. It is also nice to have patient contact and it is extremely rewarding when you and your team can make a difference to a patient’s quality of life. “Prior to my career as an ODP I was employed as interpreter for the Military Police Special Investigation Branch in Germany for 8 years, so I come from a very different background. My greatest achievement is moving to the U.K. and being successful in finding a new career that challenges me and brings me a lot of job satisfaction. If you are interested in joining the Trust as an ODP Click Here.